Buy Natracare Maxi Pads Organic Cotton Cover NIght Time (10) in the UK from our online shop or directly from our independent Scottish store. Thick, long, cushioned pads for secure comfort, great fit and effective absorption. These pads do not have wings, but have a long strip of glue along the back to ensure they stay in place. As official Natracare stockist, we sell genuine Pads & Towels directly from our shop in Scotland and online throughout the UK. Natracare stands for more than just organic and natural products. They are an award winning, ethical company committed to offering organic and natural solutions for personal health care that leave a soft footprint on the earth. View more products from Natracare. Where can you buy real Maxi Pads Night Time 10 safely online? If you are wondering where you can buy Natracare Maxi Pads Organic Cotton Cover NIght Time (10) safely online in the UK, then shop with us. We are an actual health foods shop; with real people selling real foods and products. Our award-winning independent shop is located in Stirling, Scotland since 1976. You can buy our Organic and chlorine free Sanitary products and other genuine Pads & Towels in store or safely place an order with us online or over the phone. 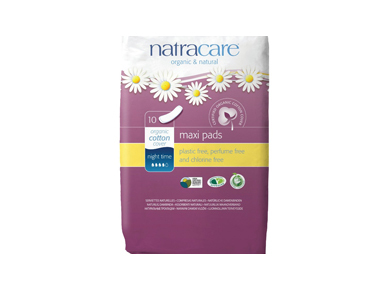 Maxi Pads Night Time 10 - Natracare Maxi Pads Organic Cotton Cover NIght Time (10) in Pads & Towels and Female Hygiene.